To install the sink in the countertop, you need to spend a lot of time and labor. 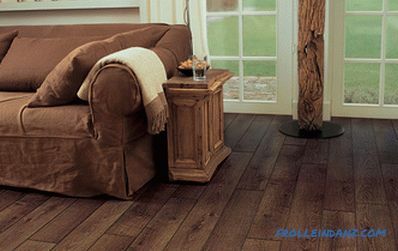 But if you properly cut a hole in the furniture unit and make installation, washing dishes will not seem such a burdensome task. Then we will talk about how to cut the countertop under the sink. Washing installation process The tabletop consists of several stages. To properly perform this time-consuming work, you must carefully cut a hole in the tabletop, while it is desirable to adhere to the instructions below. First you need to purchase a blank piece of cardboard of the required size from which the template will be cut. This working step will be simplified if the manufacturer, which is often the case, made the template himself and put it in the package with the goods. It will be necessary only to cut the template along the traced contour with scissors. If there is no template, you need to take the sink, turn it upside down, attach it to the cardboard, then use a pencil to draw the desired outline and cut the template along the finished outline. If there is no packaging with a picture, and there is no necessary sheet of cardboard, the delineation of the inverted sanitary ware is carried out directly on the table top. Next, you need to assess the future location of the furniture unit. 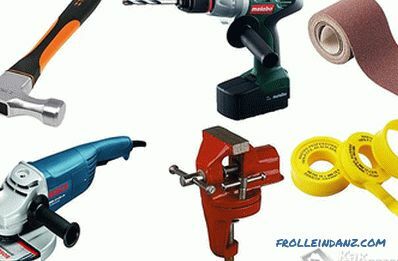 It is necessary to know in advance where the mixer will be installed, how to make the pipe layout, whether trimming the table top is foreseen before final installation. You also need to look at the design of the furniture from the inside. This will make it possible to determine which elements, if necessary, can still be cut and which cannot be touched - the supporting fragments of the table top must remain intact and intact. It is recommended to place the sink away from the wall in 10 cm, which in the future during installation will protect vulnerable spots from possible breakage. If the template is ready, it's time to use it. To make the layout of the tabletop, it is necessary to attach the template to its surface, while it must be fixed. After this operation, an outline is drawn. 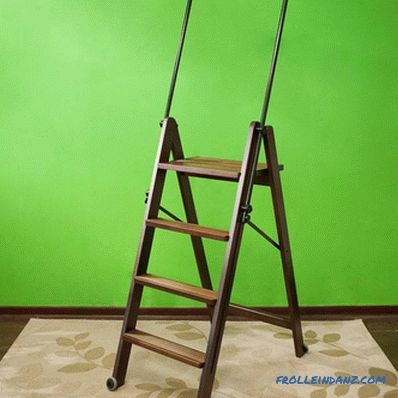 The same work is carried out if there is a factory template available. On the circled line can be cut immediately. 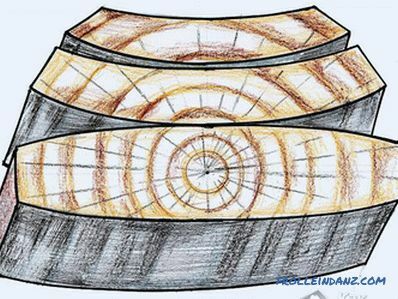 If you use a piece of cardboard or an inverted sink was encircled with a pencil on the tabletop, additional work remains to be done. The fact is that the line drawn will repeat the edges of the sink, and the hole will be inserted into the future of its bowl. Therefore, you need to draw another contour - internal. When drawing it, it is necessary to take into account the distances from the edge of the sink to the fixing elements of the plumbing fixture. The result is a new pattern that focuses on the size of the bowl. It is applied to the surface of the tabletop and a new contour is applied, along which a hole can be cut. 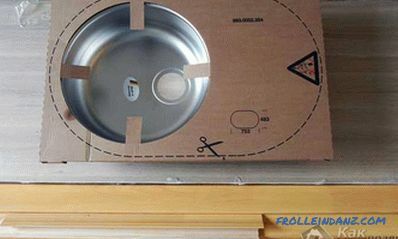 There is an option in which the cardboard template is attached to the surface of the tabletop and a hole is cut at its edges. If you look at this work from the practical side, it is inconvenient - it is better to draw the outline with a pencil. When cutting along a drawn line, there is a real chance of chipping at the inner edges of the table top. To avoid marriage, it is recommended to glue masking tape onto the surface in the area of ​​the intended contour, which in the future can be easily removed. In order to start cutting, it is necessary to drill a hole in the body of the tabletop from the inside of the drawn line. A jigsaw file is pulled into the drilled hole, after which it is fixed in the tool. Cutting should be done carefully and without haste, as when pressed, the blade can move away from the intended contour. The cut is cleaned with sandpaper, blown and carefully lubricated with silicone. Thanks to this composition, the detrimental effect of moisture on the cut surface will be minimized. If some pieces of the furniture block interfere with the installation of the sink bowl, they must be carefully trimmed. Measurements for trimming must be done accurately - it is not recommended to perform such work "by eye". You need to know that when using the manufacturer's template, cutting out the internal elements is much easier and simpler, since such details are also provided for in its manufacture. To proceed with the final installation of the sink, you must do some of the required work. First you need to try on the pipes and collect the siphon, then in the internal structure of the tabletop you need to make holes for sewer and water supply. All these works are performed by a jigsaw or a crown. After that, the mixer is mounted, if a place on the tabletop is prepared for it. In addition, if there is a need, hoses are cut.If the mixer is installed at the sink itself, a place for the equipment is determined on the plumbing fixture and a hole of the required diameter is drilled. Before installing the sink, a sealing tape is put on the sanitary ware - as a rule, it comes complete with the device. The tape is fixed not far from the edge, and a special groove is left free, into which silicone will be poured. 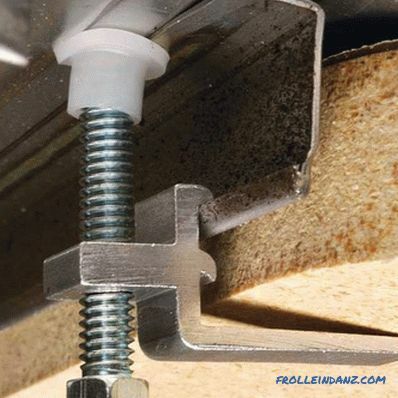 Then the fasteners are installed in their places, which, when tightened, do not reach out - they will be fixed tightly after the whole structure is completely aligned. 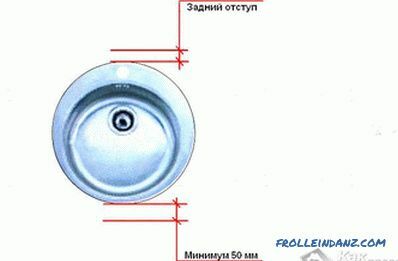 If the mixer should be fixed at the sink, it is the turn for its installation. The hole is abundantly smeared with silicone, after which the plumbing product is installed in the hole under the sink. Before mounting the mount must be bent down. In order for the sink to sit in its place and fit well into the contour of the opening, a plumbing fixture needs to be moved slightly. After that, you need to climb under the sink and finally tighten the fasteners. While the sealant is in a liquid state, it is wiped off - after a while the composition will grab and harden. If there are gaps somewhere, they must also be sealed with a sealant. The sink to the countertop is installed. Sanitary equipment can be used.